A conversation with Pete McGovern. hope you are well and life is good. I doubt you will remember me once mentioning a photographer Ithought was worth you checking out - Andres Serrano - well I just saw a copy of his book AMERICA published by Taschen at a great price and I'd like to get it delivered to you. It can also be used for upper body fitness training, it's pretty HEAVY. Don't let your dog Otto chew it till you've had a proper flick through first and let me know what you think. wow, it is a monster book...i have had a very strong reaction to it. I find it emotionally stunted, dated, horrid, commercial magazine portraiture with clumsy narrative content without any insight or subtly! hate it! I don't think i can keep it in my house incase i die and someone thinks i liked this work...REALLY hated it! hahaha... i do feel bad that you got me this as a gift, what do i do with it!! Can we return it? I am concerned that you thought i would like this work, I hope you don't feel my work is in any way similar? I've got a feeling you didn't really like the Serrano book. I think I'll be laughing too much to sleep when I go to bed tonight. I was going to get my copy down to have a look and see where you're coming from - but it was on a high up shelf and I didn't have the strength. Copies can go for £40-£50 on Amazon marketplace these days so feel free to flog it - but use someone else's eBay account to maintain anonymity. Are you sure you didn't like it? I took the afternoon off to play spot the dog at the National Gallery. In Room 44 sitting quietly is Bathers at Asnières, 1884, I forgot this was in the collection and it blew my socks off, like bumping into a major celebrity in the aisles of Tesco or perhaps Marks & Sparks. I was even more delighted to discover a little dog, sitting obediently by its owner in the bottom left hand side above Seurat’s signature. It is barely able to contain its excitement as the boy perhaps makes the sound of the factory whistle in his cupped hands. Seurat uses the dog classically as a foil; barely noticeable, its naivety to the drama around it only helping to emphasise the relative complexity of the human experience. In our new age we can empathise with the irrepressible natures of Seurat’s anonymous subjects as they find space to express their humanity at odds with the encroaching industrial and technical revolutions. The factories are demoted to the horizon; the heat haze seems to diminish their power in this moment atleast. Is this a scene of the power of humanity over adversary or a nostalgic last glance at a fading world? Boris Mikhailov’s great series ‘Salt Lake 1986 is the best representation of the continuation of these themes. Gluttony is one of the ancient Christian deadly sins explains Catherine Pepinster, Catholic editor of The Tablet, she goes onto discuss that 'allowing ourselves to become so satiated, shapes us both physically and morally'. The obese have become a visual metaphor for our own decadence and personal failings and we seem to despise them for it but it is unfair to define a life so simplistically or in two dimensions. I am attempting to discuss this in The Big Society. Moralising more than overlooks the complex human stories that have led to these visual manifestations. Bereavement, mental health and abuse are some of the stories behind the lives of those i met and many other factors contribute to a moment in the flux of a life. In this instance the camera and Pepinster's comments have a cold, uncaring, bluntness in common. In the act of judgement, we are recognising something in ourselves and in that understanding must acknowledge a similar emotional possibility in our own future. We are defined as individuals by how we manage our emotional experiences and some of the consequences can be more visual than others. See the juxtaposition below (not included in the original series) of Sacha in her backyard and an image of her as a young girl. The Infinite Monkey Theorem states that a monkey hitting a typewriter randomly ad infinitem eventually will write the works of Shakespeare. Well, there are much better odds that given a camera, it will take a great photograph. Here is as good example as any, not by a monkey, but by my ex-boyfriend. 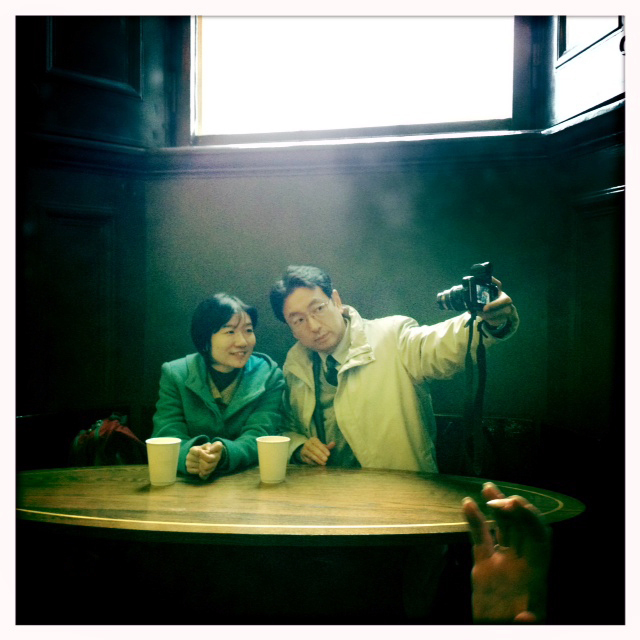 He took this image of some tourists in the National Gallery Cafe in London on his iPhone. Ok, so i am still a little bitter but comparing him to a monkey might be a little insensitive. He's a gardener actually and like many people loves modern art photography, it has seeped into the consciousness of all of us. Did he know this was a great photograph when he saw them? What is the criteria that defined this moment enough for him to look up from his lemon drizzle cake and want to record it? 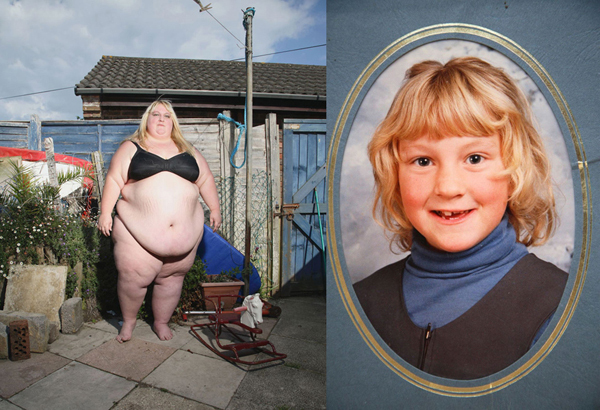 I immediately recognised this image as valuable to me and I have entered this on his behalf to the Taylor Wessing Portrait Prize 2012. It will be judged equally along side thousands of other works including my own and it deserves a chance at a little spot on the wall of the National Portrait Gallery, it is a discussion on what photography is now. Often the barometer of greatness is the recognition of something we have seen before. Hence, the broader our frame of reference, the better chance we have of recognising true works of value. Without it, we only respond to the everyday common demoninators of image making. The challenge is to take an image of value to ourselves and leave the definition of greatness to others. Good Luck. I am re-visting 'Ron & Roger' the exhibition project on homosexual couples that showed at the Candid Arts Trust and Tate Modern. It originally published in The Observer Magazine and since has shown in Turkey and China. 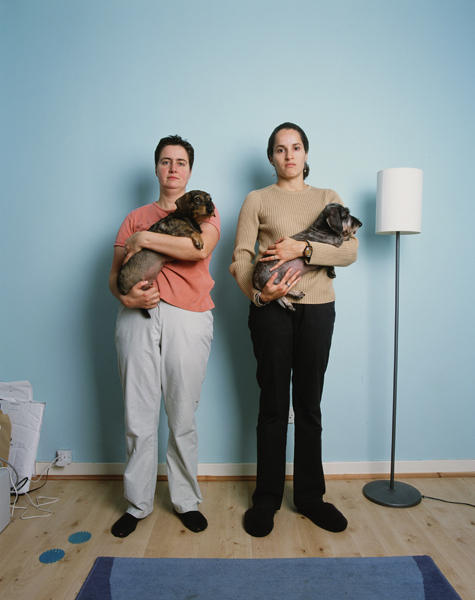 The series documents the very first to participate in the London Partnership Register; a non-legally binding initiative introduced in 2001 to offer non hetero-normative couples the chance to record their relationship officially. Introduced by the previous London Mayor, Ken Livingstone, this initiative prised open Pandora's Box on the issue of equal rights for all couples and led to a sea change in public opinion and prejudice around the world. The series' compositional dogma was inspired by Jan Van Eyke's masterpiece The Arnolfini Marriage. Its a composition that possesses me even today and in all my most valuable work there is a dog whistle to this camera obscura rigidity. I am interested in the paradox of the formality of space and the chaos and complexity of the human experience. Every time i visit the Arnolfini Marriage I see something new; today I have noticed the clumsy shadow around the man's shoeless feet which suggests some repainting and also the shoes in the back of the image implying that the woman does not have her shoes on either. Coincidentally many of the couples in Ron and Roger were photographed in their socks or slippers, it felt very private. The detail and realism in this painting only adds to its mystery which i hope to bring to my work. Its history is not fully understood and there are theories that suggest that the painting itself is the record of an unofficial or undisclosed union, which connects this painting in a very direct way to these contemporary issues. I like to think of 'Ron and Roger' as a time capsule record of the private domestic lives of the subjects; like the painting, the context partially lost in time, with only clues to the era within the work. A puzzle to be unlocked by a bemused future audience. The collection of high res files are stored at the Hall Carpenter Archives at the London School of Economics. The Troika Editions show Residual Traces at Photofusion, London deals with the camera as record of contemporary history. An era is captured either through direct visual clues or inherently within the process itself. No clumsy inclusion of aesthetic b/w reportage here, all the images are in glorious unwieldy color. It is a discussion of the timeline unique to photography, “immediate nostalgia’ Sontag called it. Bridget Coaker from Troika Editions has brought together works by established and less known photographers in a sentimental reflection on a toxic and troubled landscape, now erased by the ambition of the London 2012 Olympics. We are left to reflect on the space that inspired artists and residents alike. This is a discussion about the legacy of landscape, culture and photography, we are the future audience looking back at our immediate past and reflecting on what we loose as we inevitably evolve and change.